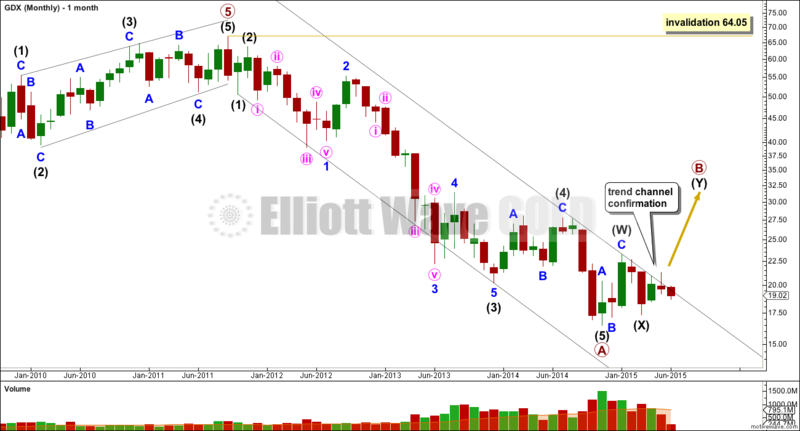 Elliott wave charts only today. 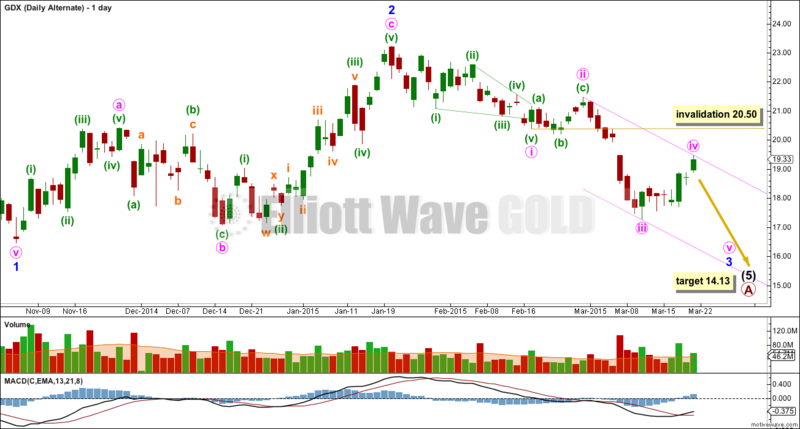 The bull wave counts for Gold have been invalidated, so I will not follow them for GDX. I will let Gold lead GDX. GDX has been in a bear market since September 2011. While price remains below the upper edge of the channel drawn here there has been no technical confirmation of a trend change from bear to bull. The bear market should be expected to remain intact until there is confirmation it is not. At 11.22 intermediate wave (5) would reach equality in length with intermediate wave (1). Intermediate wave (5) must subdivide as a five wave structure, either an impulse or an ending diagonal. At this stage, it will not fit as an ending diagonal, so the more common impulse should be expected to complete. Minor wave 4 may not move into minor wave 1 price territory above 16.45 within the impulse of intermediate wave (5). Within intermediate wave (5), minor wave 3 is close to an end. At 12.37 minuette wave (v) would reach equality in length with minuette wave (i). 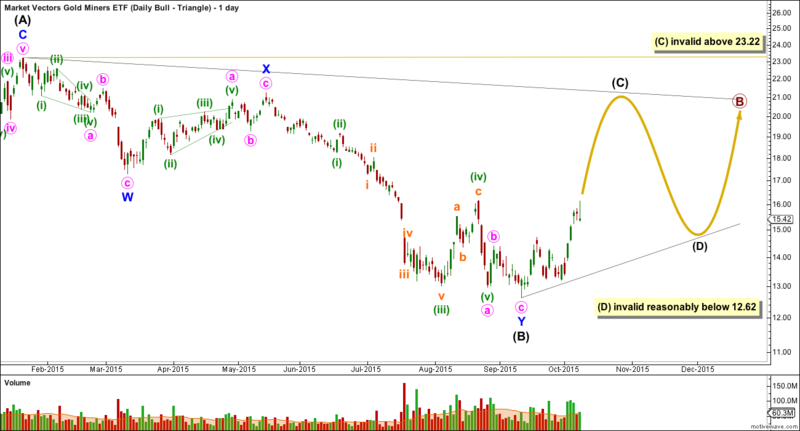 Minuette wave (iv) at this stage looks like it may be a completed regular contracting triangle. If the triangle is invalided by movement above 14.07, then this fourth wave may be morphing into a combination. At that stage, the alternate below should be used. 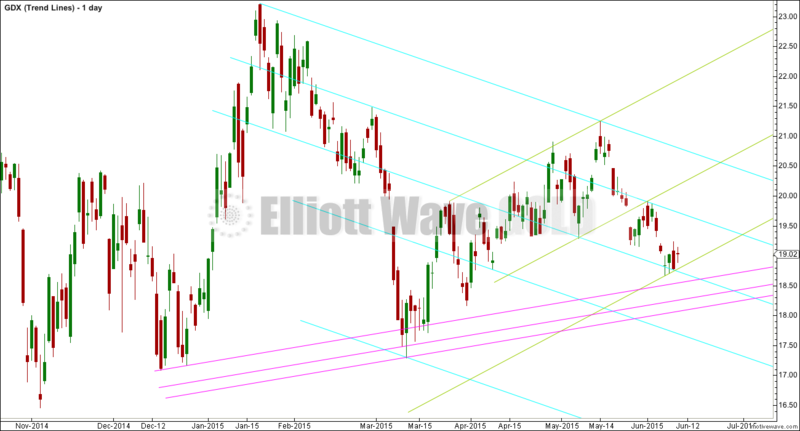 Minute wave v fits nicely within an Elliott channel at this stage. 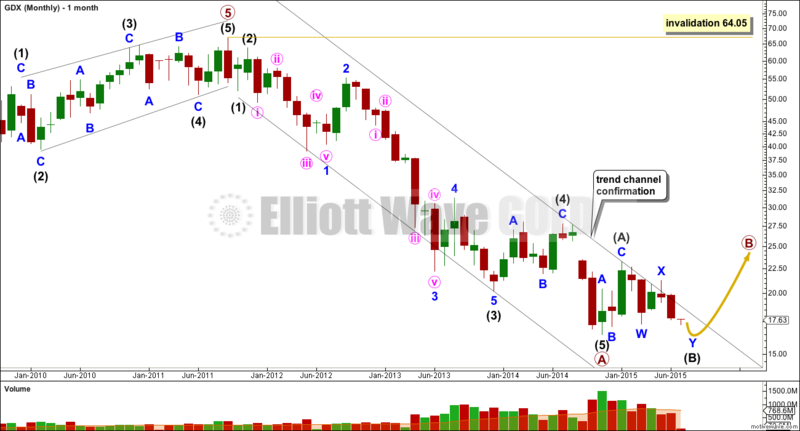 If price remains within the channel and moves lower, then minuette wave v may be complete. Thereafter, a breach of the channel would confirm that minuette wave v is over, so minor wave 3 should be over. It is also possible that the triangle is subminuette wave b within a zigzag for minuette wave (iv). 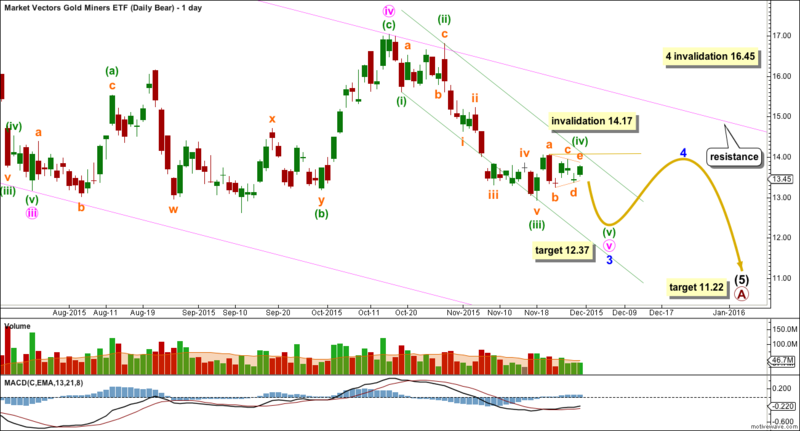 This would see minuette wave (iv) move higher for a couple to a few days. 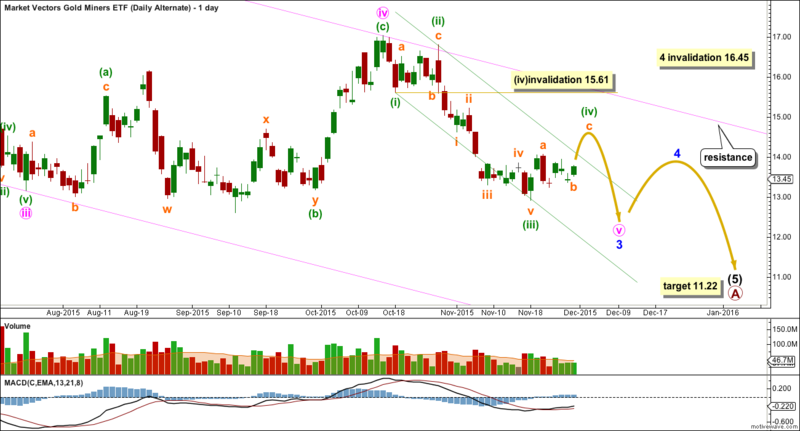 It may not move into minuette wave (i) price territory above 15.61. This idea must have a lower probability because it would see minuette wave (iv) breach the Elliott channel and there would be less alternation between minuette waves (ii) and (iv). ADX indicates there is no clear trend. ATR agrees as it is declining. On Balance Volume sits between two parallel trend lines. A break out of this range by OBV may precede price direction. As price moves sideways volume declines. There is no support for upwards days. Overall, the volume profile for recent movement looks more bearish than bullish. There are at this stage three likely structures for primary B for the bull wave count . 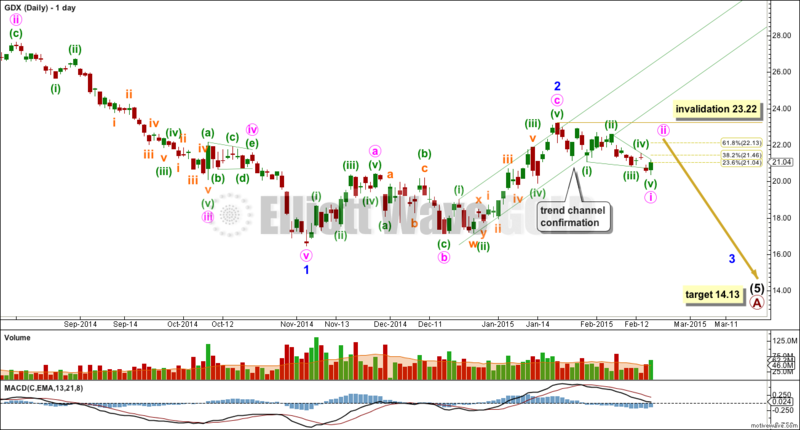 Intermediate wave (Y) may be an expanded flat. The target may be too low as it may not see primary B breach the bear market channel, and it should. I will let Gold lead. 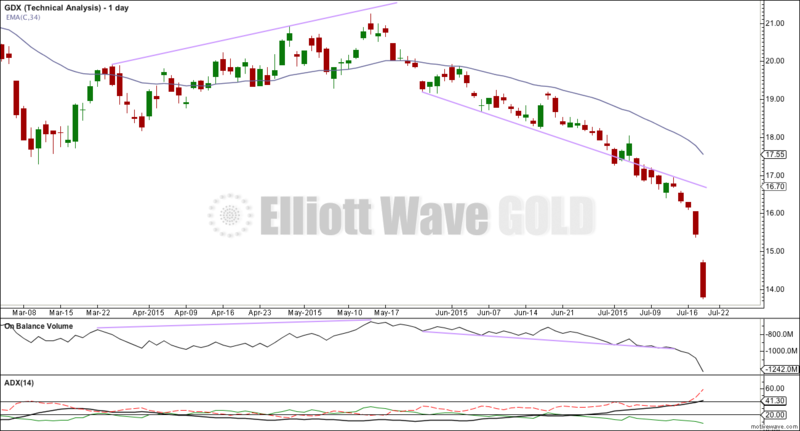 For this reason only I will not publish a bull wave count for GDX. Changes to last analysis are bold. Price remains within the best fit channel on the monthly chart. 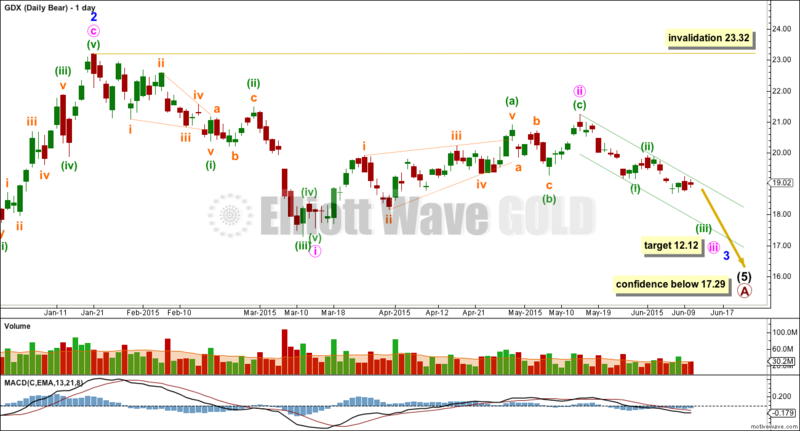 A five wave structure down is completing, which may be an A wave within a larger correction. 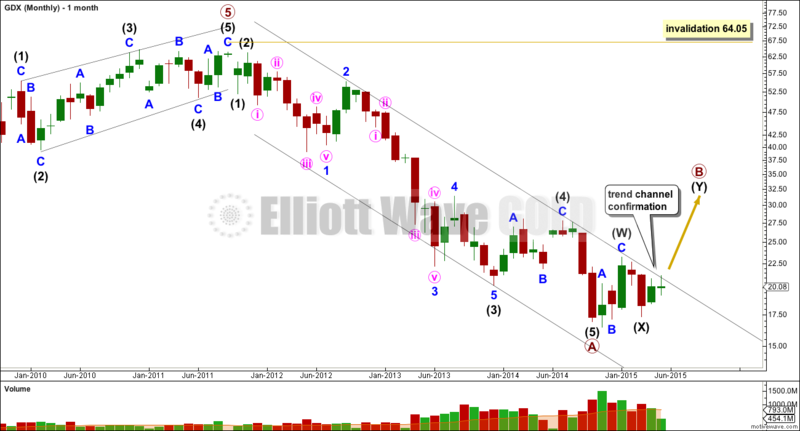 Within minute wave iii, a second wave correction may not move beyond its start above 21.26. At this stage, regular technical analysis strongly favours the bear wave count. A downwards trend is clear and strong. 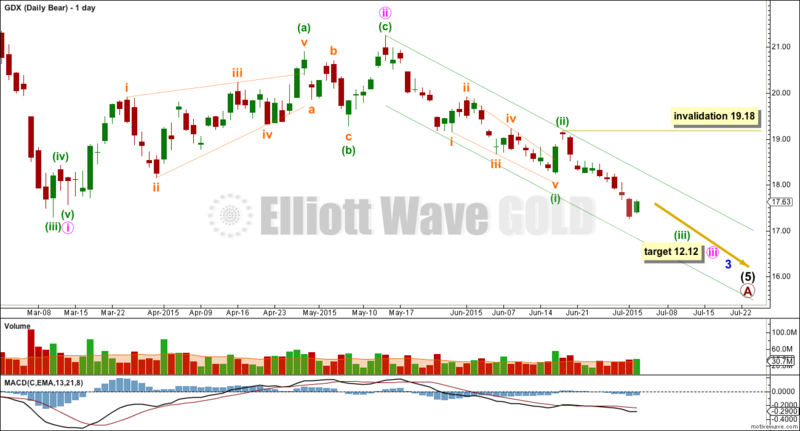 The middle of the third wave for GDX may have now passed. At 12.12 minute wave iii would reach 1.618 the length of minute wave i. 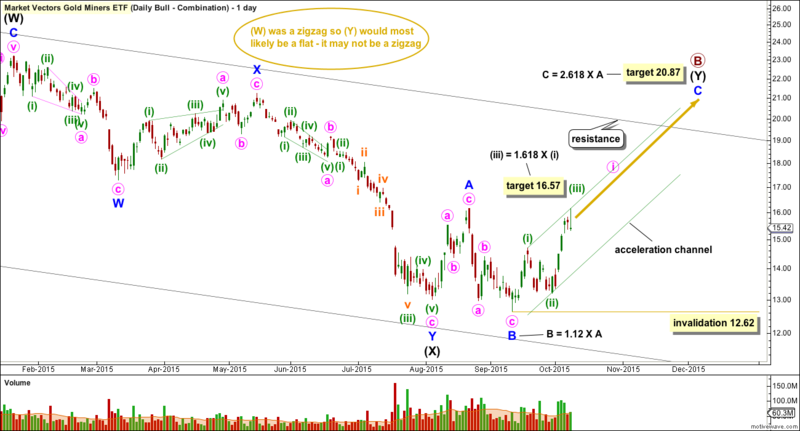 This target expects there would be no more swift strong fifth wave extensions for GDX, which may not be a very reasonable expectation. If the target is wrong, then it may be too high. Subminuette wave iv may not move into subminuette wave i price territory. Look for it to find resistance at the upper edge of the orange channel, and if that is breached at the lower edge of the green channel. Looking back at past major lows for GDX, a volume spike is not seen right at the low but one to four days prior to the low. 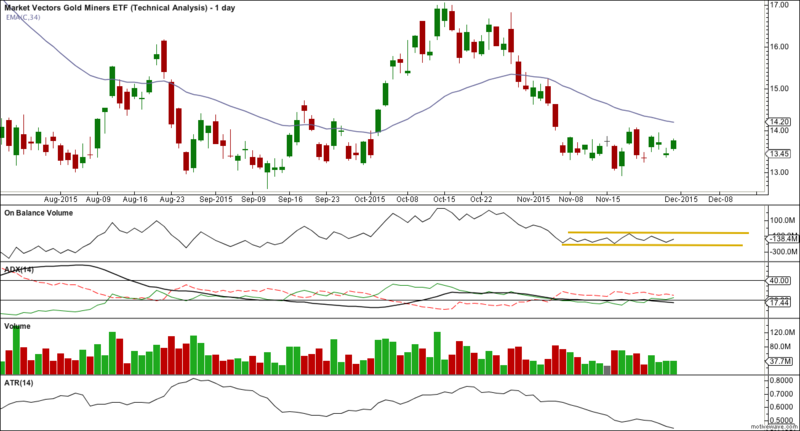 ADX continues to indicate a strengthening downward trend for GDX. On Balance volume continues to move lower along with price, the trend is supported by volume. Price is below the 34 day EMA indicating a downward trend. The gap looks like a breakaway or measuring gap and not a pattern gap, so it should not be expected to be filled. 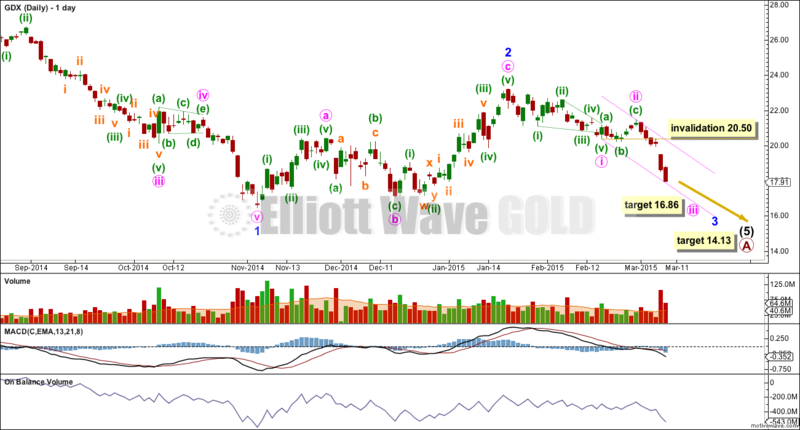 I have the same two Elliott wave counts for GDX. I still favour neither. Minute wave ii may not move beyond the start of minute wave i above 23.22. Intermediate wave (5) has now three overlapping first and second waves: minor waves 1 and 2, minute waves i and ii, and now also minuette waves (i) and (ii). This indicates strong downwards movement ahead. At 12.12 minute wave iii would reach 1.618 the length of minute wave i. 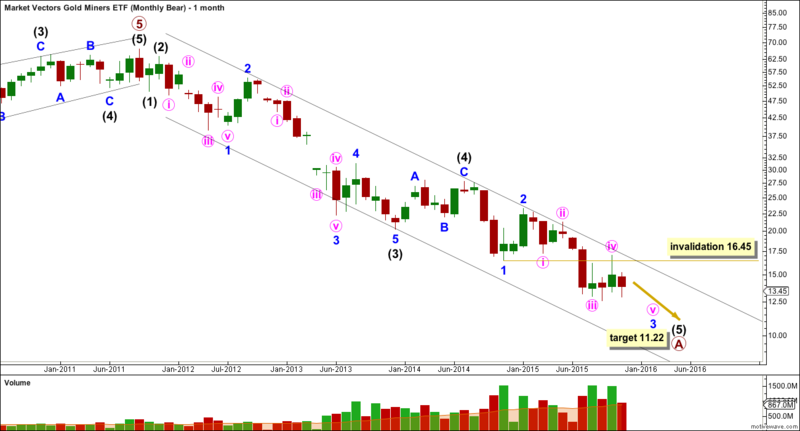 Within minuette wave (iii), upwards corrections should find resistance at the upper green trend line. 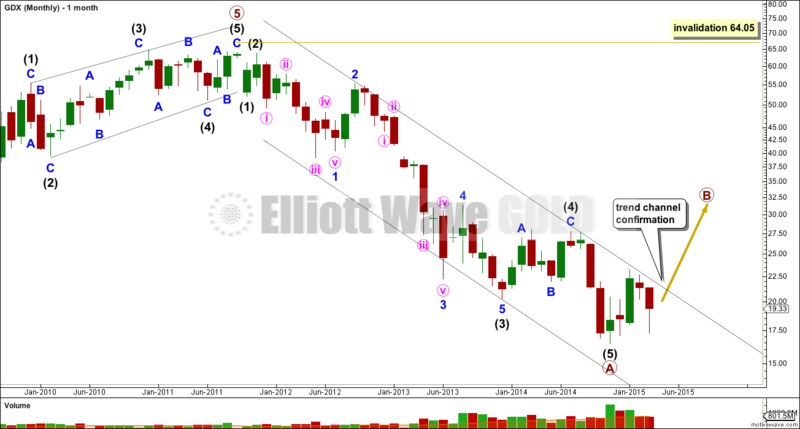 No second wave correction may move beyond the start of its first wave above 19.18. 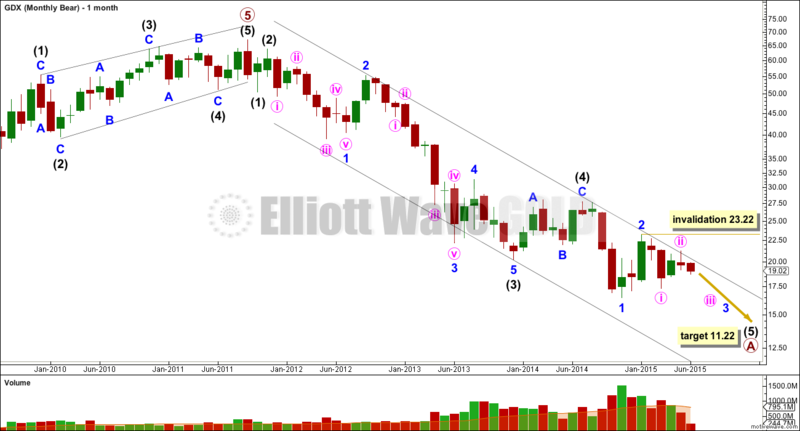 Downwards momentum has not yet shown an increase beyond that seen for minute wave i, and so it should be expected to increase further in the next few weeks. The bull wave count expects that the five wave impulse is complete for primary wave A down. Within it, the extended wave is intermediate wave (3). Intermediate wave (3) is 0.11 longer than 2.618 the length of intermediate wave (1), and there is no Fibonacci ratio between intermediate wave (5) and either of (1) or (3). The channel drawn about primary wave A down is a best fit. The upper edge is still providing resistance. For the bear count (or any variation of it) to be discarded this trend line must be breached. That would provide trend channel confirmation that primary wave A is over and the next wave of primary wave B would then be underway. Because primary wave A subdivides as a five, primary wave B may not move beyond its start above 64.05. Primary wave B must subdivide as a corrective structure. 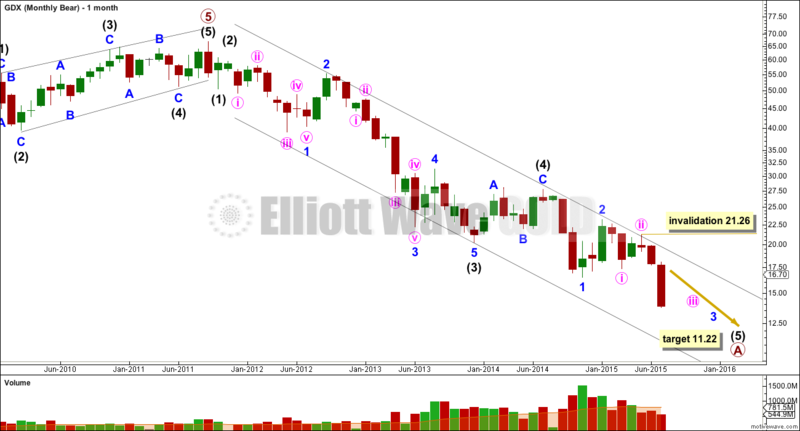 At this stage, it looks now like it may be unfolding as a flat correction and within it intermediate wave (A) is a three, a zigzag, and intermediate wave (B) is an incomplete double zigzag. If intermediate wave (B) reaches 17.13 or below, then the minimum requirement for it to correct to 90% of intermediate wave (A) for a flat correction would be met. Because the downwards structure within intermediate wave (B) is incomplete, it looks very likely that this minimum would be met. 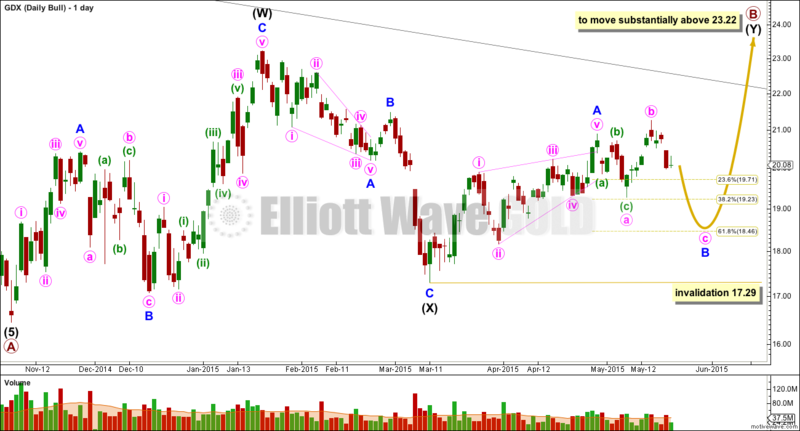 Intermediate wave (B) is unfolding as a double zigzag. 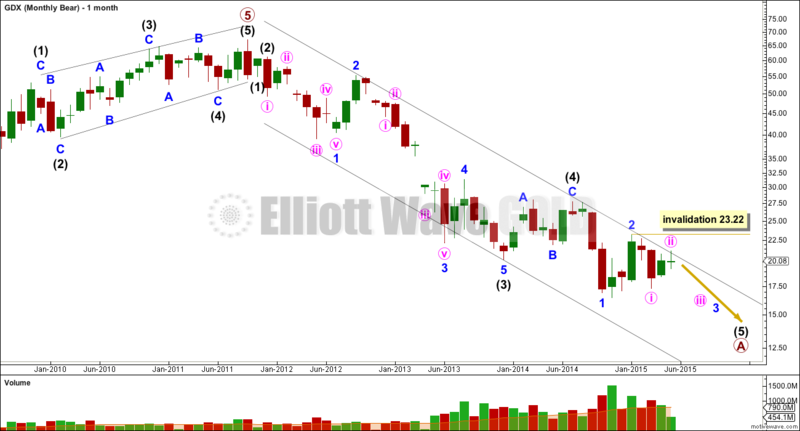 The second zigzag labelled minor wave Y is deepening the correction. The normal depth for a B wave within a flat correction is between 1 to 1.38 times the A wave. This gives a range for the normal depth of intermediate wave (B) between 16.45 to 11.85. At 16.17 minute wave c would reach equality in length with minute wave a. Blue Lines: from the high at 55.25 to the high at 28.03 price moved lower while On Balance Volume moved higher. This negative divergence may indicate a larger fall to come. 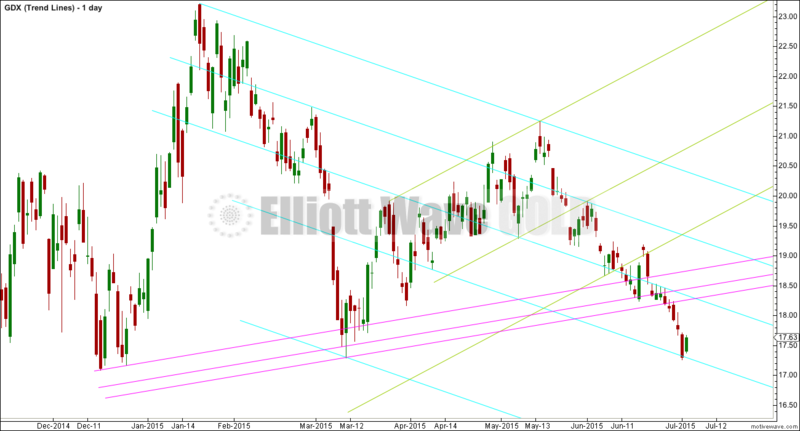 Lilac Lines: More recently, as price has made lower highs, OBV has also made lower highs. There is no divergence, so the fall in price is supported by a fall in volume. Green Lines: Recently price has also made higher lows. Again OBV agrees. There is no divergence. Price is now breaking below support of its green trend line, as is OBV. This is a further bearish indicator. ADX now indicates a clear and strengthening downwards trend. OBV agrees with the fall in price. Price remains below the 34 day EMA. 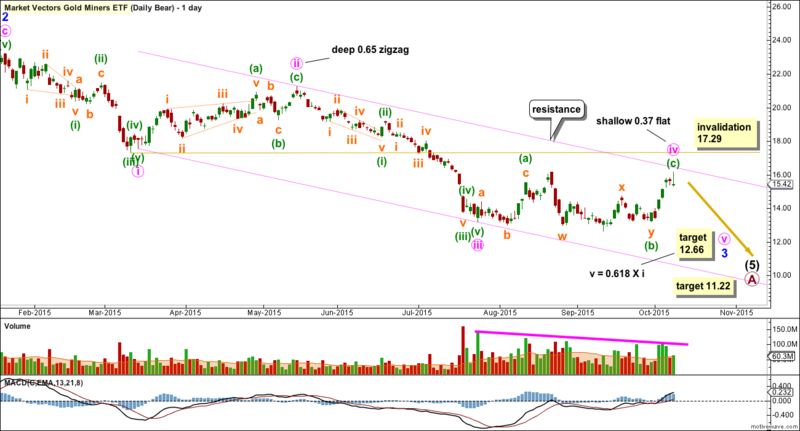 All regular TA indicators point to a strong downwards trend at this time for GDX. The bear wave count is favoured. This is my own particular method of trend line analysis. Each series of parallel lines is coded with a different colour. 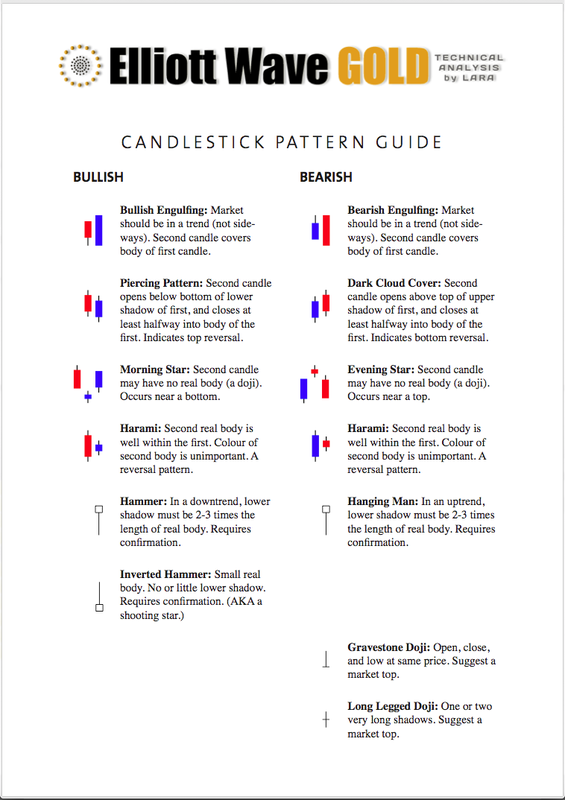 I use this approach to suggest potential areas of support and resistance. The bull wave count expects that a five wave impulse is complete for primary wave A down. Within it, the extended wave is intermediate wave (3). Intermediate wave (3) is 0.11 longer than 2.618 the length of intermediate wave (1), and there is no Fibonacci ratio between intermediate wave (5) and either of (1) or (3). Primary wave B must subdivide as a corrective structure. The wave down labelled intermediate wave (X) is 88% of the prior upwards wave of intermediate wave (W). A flat correction can be ruled out for primary wave B, at this stage, because this is less than 90%. 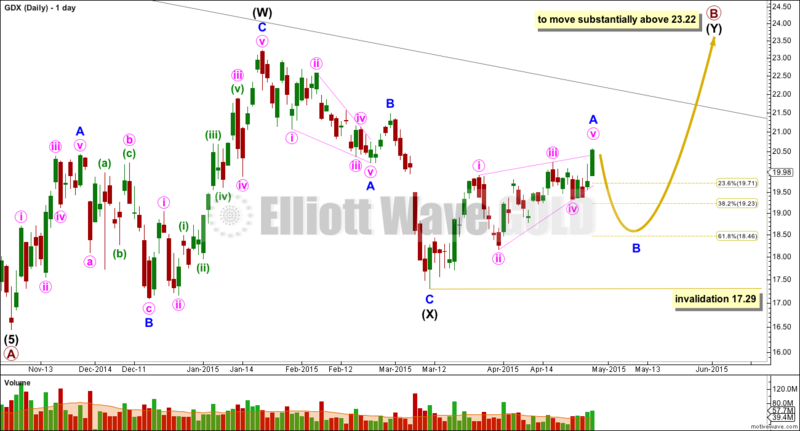 Intermediate wave (W) subdivides well as a zigzag. Primary wave B may be unfolding as a double zigzag. 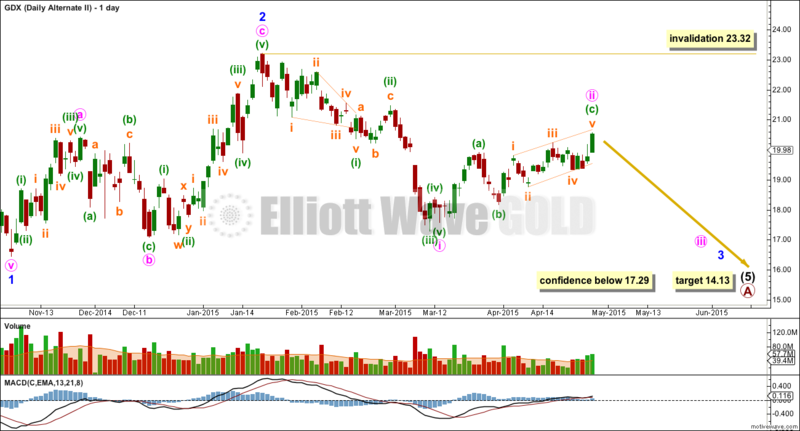 The first zigzag in the double labelled intermediate wave (W) is complete. The double is joined by a three in the opposite direction, a zigzag labelled intermediate wave (X) which is also now complete. The second zigzag in the double is underway labelled intermediate wave (Y). The purpose of the second zigzag in a double (and the third in a rare triple) is to deepen the correction when the first (and second) zigzag does not move price deep enough. To achieve this purpose the second (and third) zigzag moves substantially beyond the end of the first (and second). 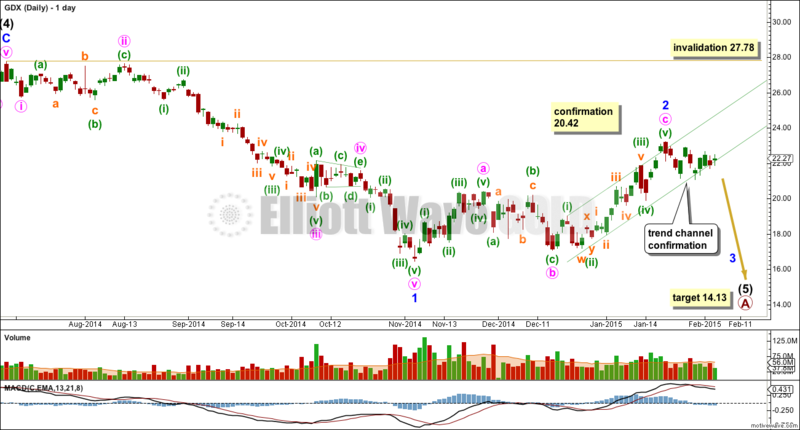 Intermediate wave (Y) may be expected to move substantially above the end of intermediate wave (W) at 23.22. Within intermediate wave (Y), minor wave A is a complete leading contracting diagonal. Minor wave B is now a complete expanded flat. Within it, minute wave c is 0.04 longer than 1.618 the length of minute wave a. At 28.12 minor wave C would reach 2.618 the length of minor wave A. This would see intermediate wave (Y) achieve its purpose of deepening the correction for primary wave B. 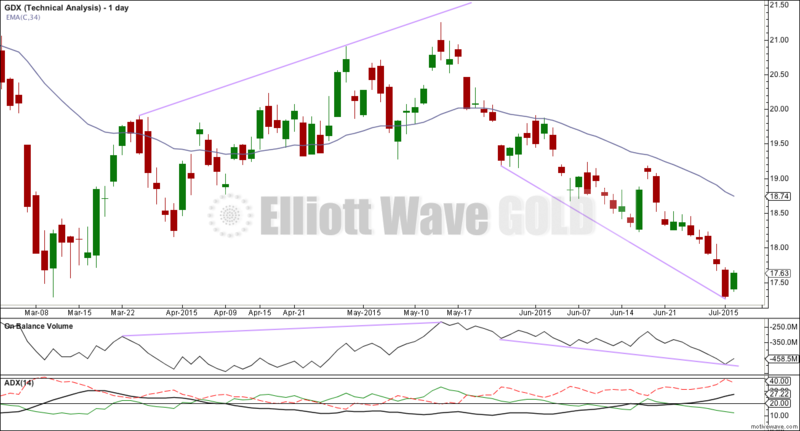 While price continues to find strong resistance at the upper black trend line of this channel, this bear wave count must be considered alongside the bull wave count for GDX. A new low below 17.29 would at this stage invalidate the bull wave count and provide confirmation for this bear wave count. 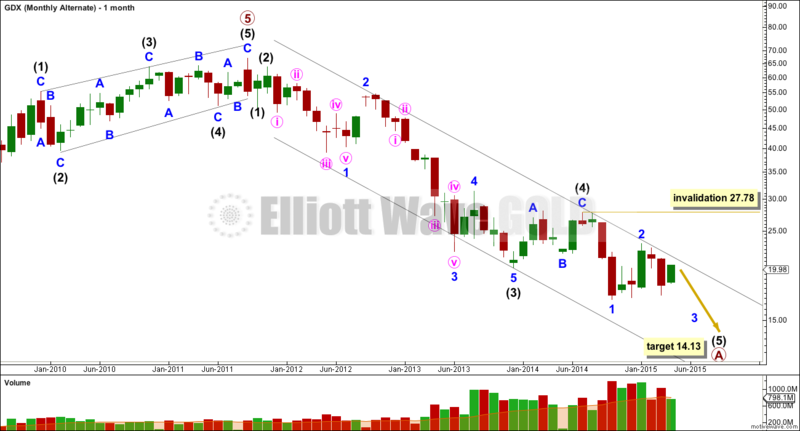 This bear wave count expects a third wave down to begin to gather momentum. At 12.12 minute wave iii would reach 1.618 the length of minute wave i. Draw a base channel about minuette waves (i) and (ii). Along the way down, upwards corrections should find resistance at the upper trend line. A clear breach of the upper green line would reduce the probability of this bear wave count. 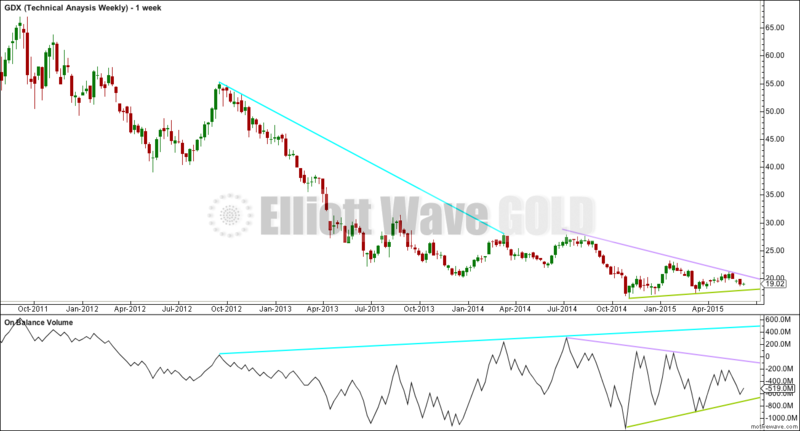 The green and lilac trend lines on both price and OBV are converging suggesting a breakout is coming closer. 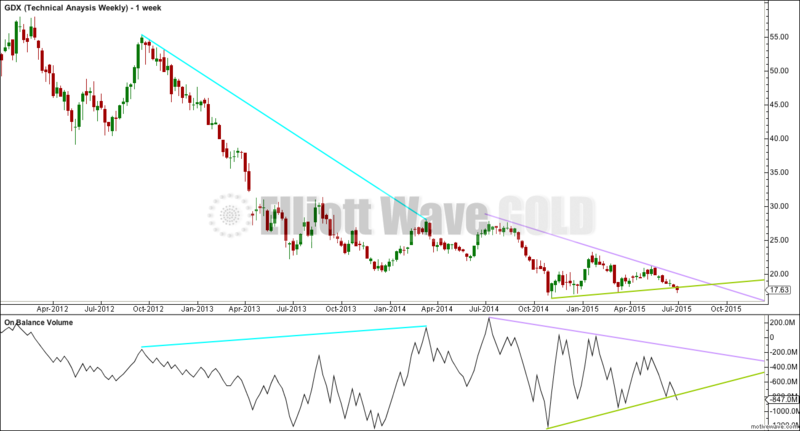 With the strong divergence between price and OBV from September 2012 to July 2014 a downwards breakout may be slightly more likely. ADX is just over 15 and rising. The -DX line (dashed red) is above the +DX line (green) indicating this may be the start of a new downwards trend. If ADX rises to 20 or above a downwards trend would be more clearly indicated. As price falls OBV also falls. There is no divergence, so this fall in price is supported by OBV. Price is below the 34 day EMA. The trend may be expected to be more likely down than up at this stage. The bull wave count expects that a five wave impulse is complete for primary wave A down. Within it, the extended wave is intermediate wave (3). There is no Fibonacci ratio between intermediate waves (3) and (1), and intermediate wave (5) is 0.98 short of equality in length with intermediate wave (1). (This chart is on a semi log scale). This daily chart shows all of primary wave B so far. The wave down labelled intermediate wave (X) is 88% of the prior upwards wave of intermediate wave (W). A flat correction can be ruled out for primary wave B, at this stage, because this is less than 90%. Within intermediate wave (Y) minor wave A is a complete leading contracting diagonal. Minor wave B is most likely an incomplete expanded flat. I am not labelling minor wave B over at the low of minute wave a, that looks to be too brief. Minor wave B may end closer to the 0.618 Fibonacci ratio of minor wave A about 18.46. Thereafter, a five wave structure up (very likely to be an impulse) for minor wave C may be very long. While price continues to find strong resistance at the upper black trend line of this channel this bear wave count must be considered alongside the bull wave count for GDX. Minute wave ii is now very likely complete. 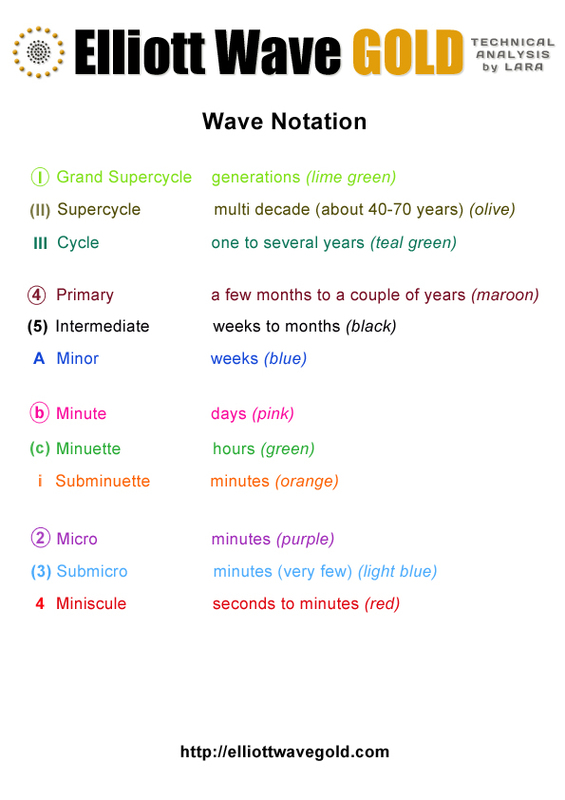 It is shorter in duration than minor wave 2 one degree higher. This bear wave count expects a third wave down to begin to gather momentum. I have two wave counts for GDX today. I favour neither. Charts only today. 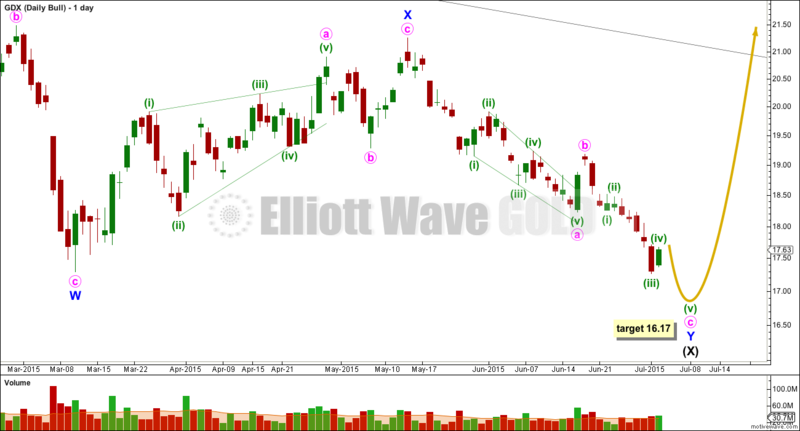 I have a new bullish Elliott wave count for GDX for you. 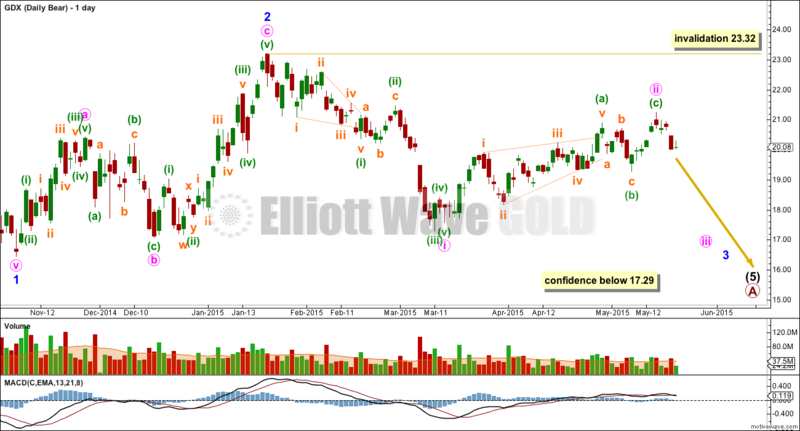 The bearish Elliott wave count will be an alternate, in line with Gold. 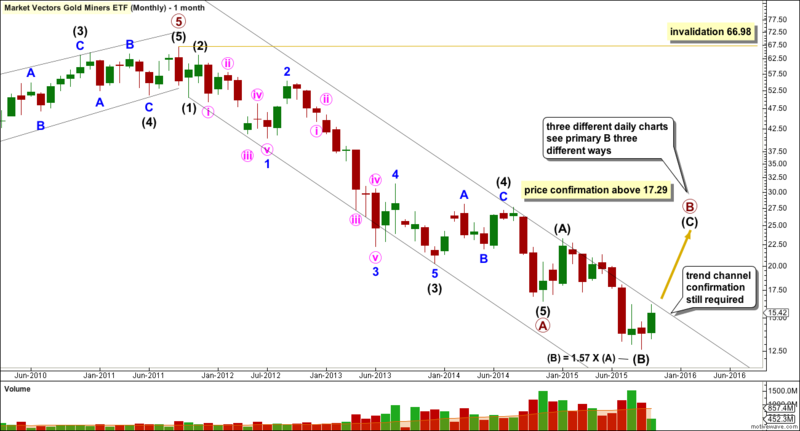 For GDX this downwards movement looks like a five wave impulse which may be complete. 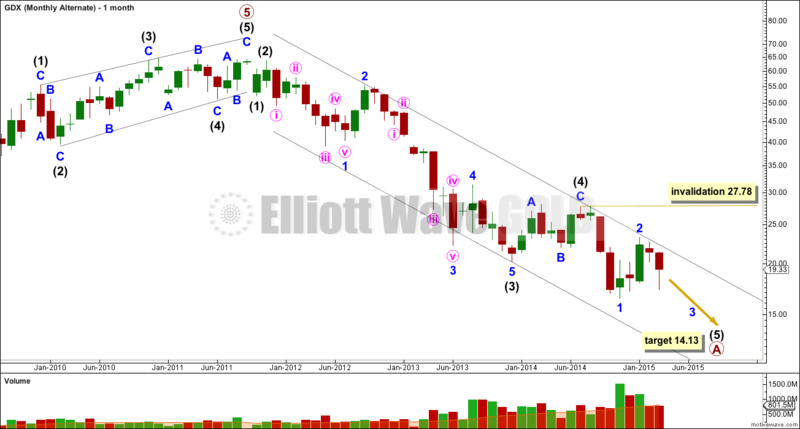 This wave count would required a clear breach of the channel before I have confidence in it. If primary wave A is a five then primary wave B may not move beyond its start above 64.05. Primary wave A lasted 38 months. B waves exhibit the greatest variety in form and structure. Primary wave B may be a quick movement, or it may take longer. At this stage there are multiple corrective structures it may be unfolding as. If primary wave B has begun then it may be unfolding as a double zigzag (as labelled), or a single zigzag with a leading diagonal incomplete for primary wave A, or a double combination or a triangle. All possible corrective structures are still open. Because the downwards wave labelled intermediate wave (X) is less than 90% the length of intermediate wave (W), this cannot be a flat correction unfolding and may only be a double zigzag or double combination. 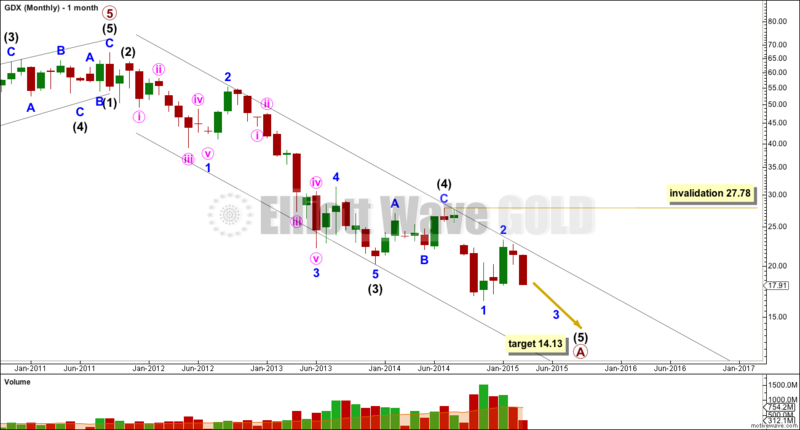 The second corrective structure may be either a zigzag, flat or triangle, and can make a new low below the start at 16.45. There can be no lower invalidation point. 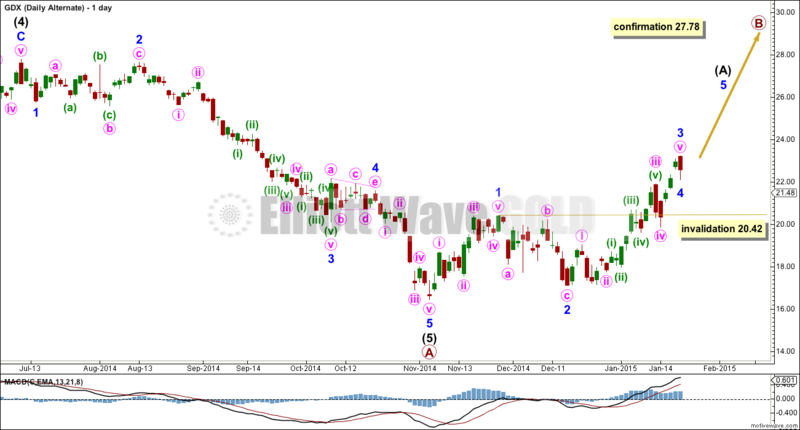 The only thing I am reasonably confident of for this main wave count is that overall GDX should be in an upwards trend for the next several weeks. Intermediate wave (W) lasted 51 days and intermediate wave (X) lasted a Fibonacci 34 days. Intermediate wave (Y) may be expected to most likely last a Fibonacci 55 days. This was the only wave count up until today. 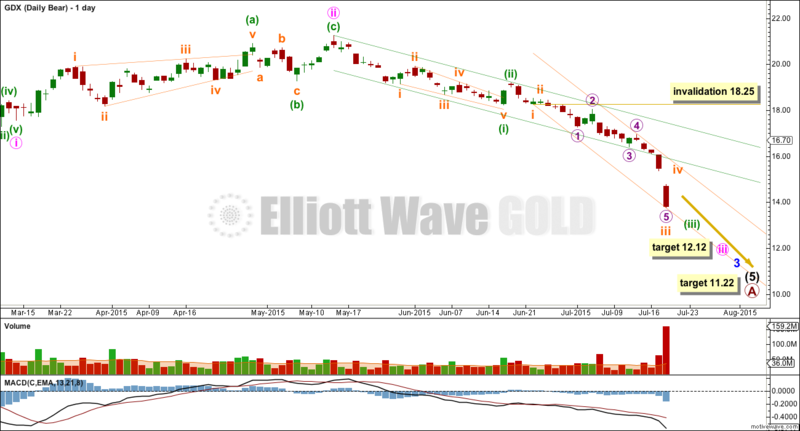 I am letting Gold determine the wave count for GDX. It is possible that intermediate wave (5) is incomplete. At 14.13 intermediate wave (5) would reach equality in length with intermediate wave (1). 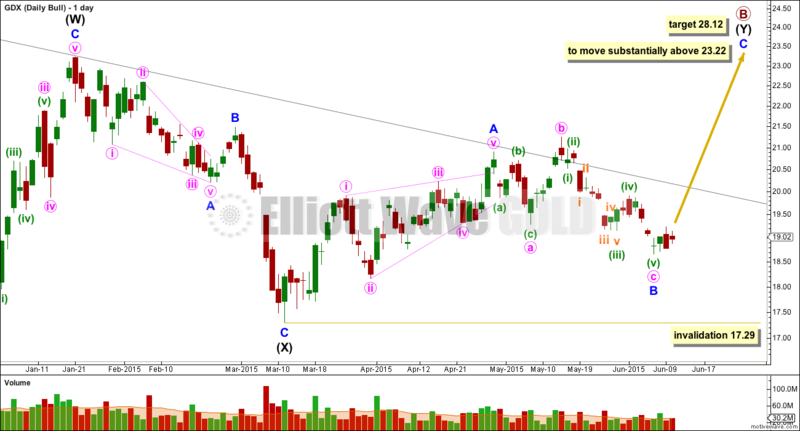 Within it minor wave 2 may not move beyond the start of minor wave 1 above 27.78. Minor wave 3 must move below the end of minor wave 1 at 16.45. There is no Fibonacci ratio between minute waves i and iii. So far within the new downwards movement of minor wave 3, I have tried to see this as either a series of overlapping first and second waves or a completed diagonal. The diagonal has a better fit. This wave count expects some upwards movement for minute wave ii. Second wave corrections following leading diagonals in first wave positions are often quite deep, at least to the 0.618 Fibonacci ratio and sometimes deeper. 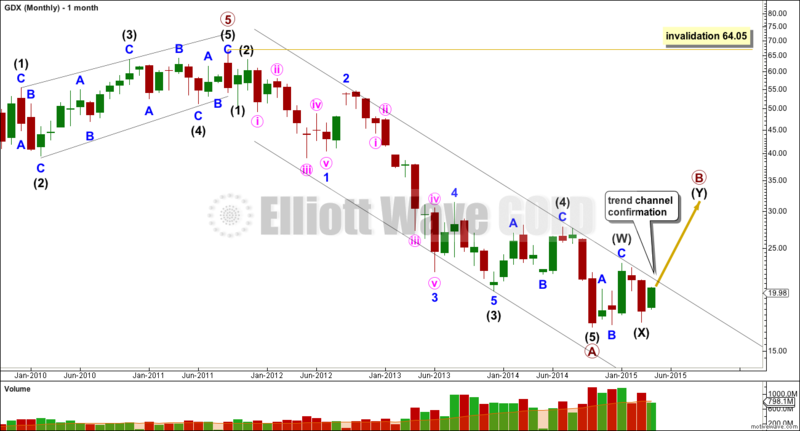 I would expect minute wave ii to move higher to 22.13 or above. 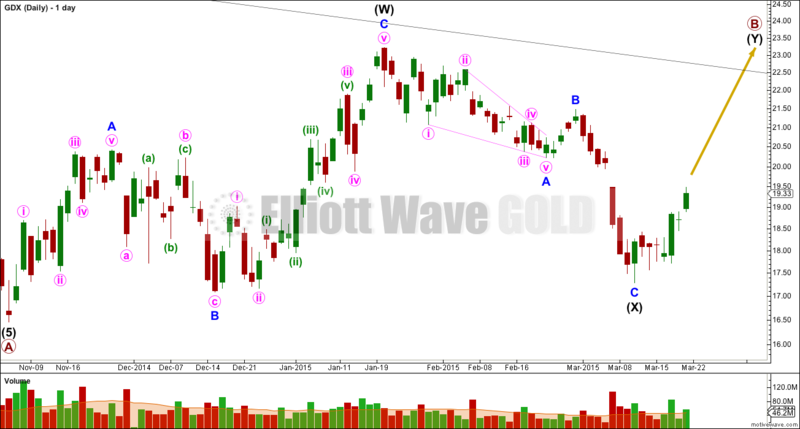 The situation for GDX remains exactly the same as last Elliott wave analysis. 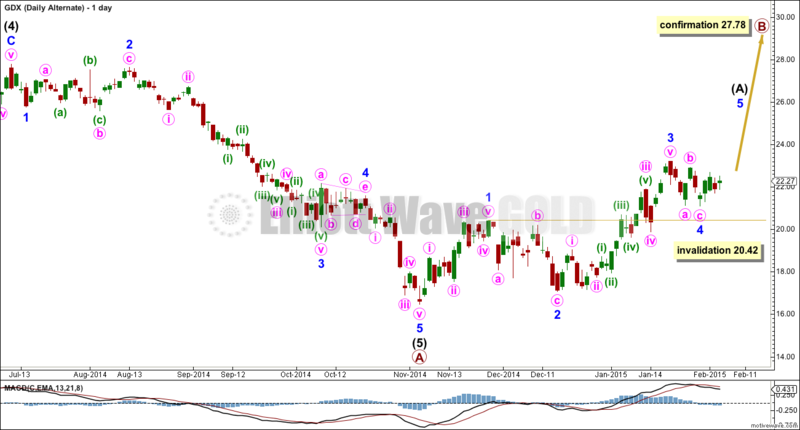 For GDX the main and alternate wave counts have exactly the same subdivisions, only the degree of labelling differs. This means it is impossible at this stage to determine which is correct, and in my judgement they have a completely even probability. A-B-C and 1-2-3 have exactly the same subdivisions as they both subdivide 5-3-5. 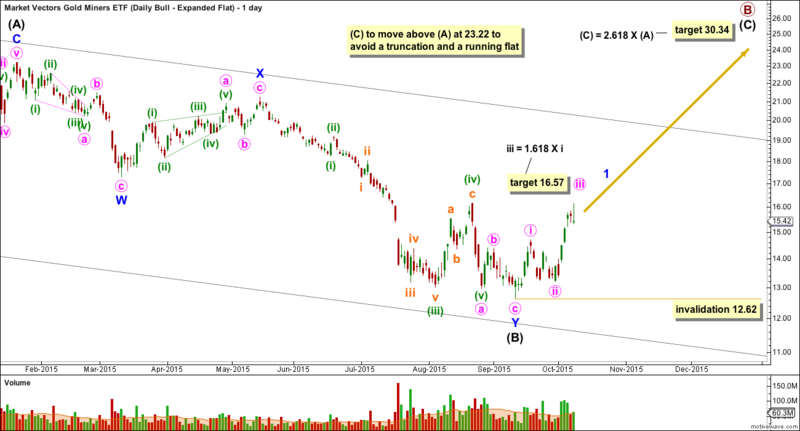 This main wave count requires a new low below 20.42 for confirmation. At this stage a new high above 23.22 would substantially reduce the probability (but not finally invalidate) of this wave count. If this happens the alternate will be strongly preferred. Alternatively, if this main wave count is correct then downwards movement should begin to build momentum as a third wave begins. This wave count moves everything within intermediate wave (5) up one degree to see it as a complete impulse. 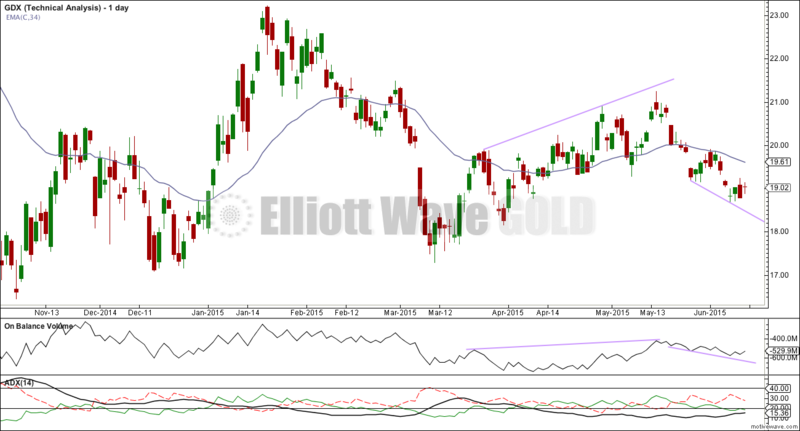 Within the new upwards trend a clear five up should develop on the daily chart. Within that minor wave 4 may not move into minor wave 1 price territory below 20.42. 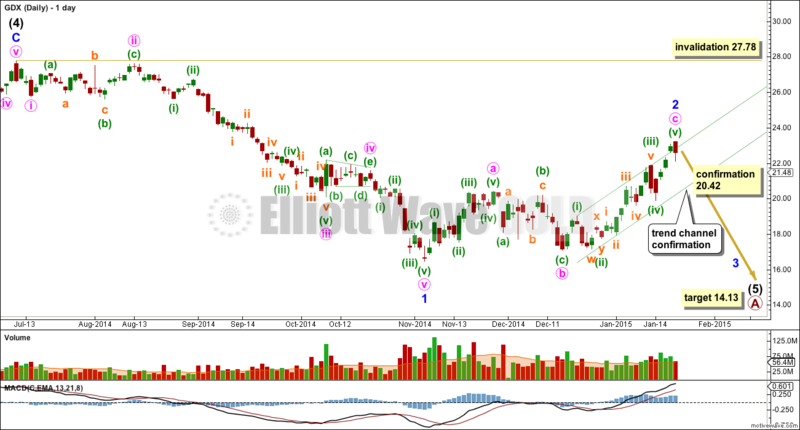 Minor wave 2 looks like a zigzag. Minor wave 4 is probably incomplete, and may continue sideways to be better in proportion to minor wave 2 (although GDX does not always have nicely proportioned waves). 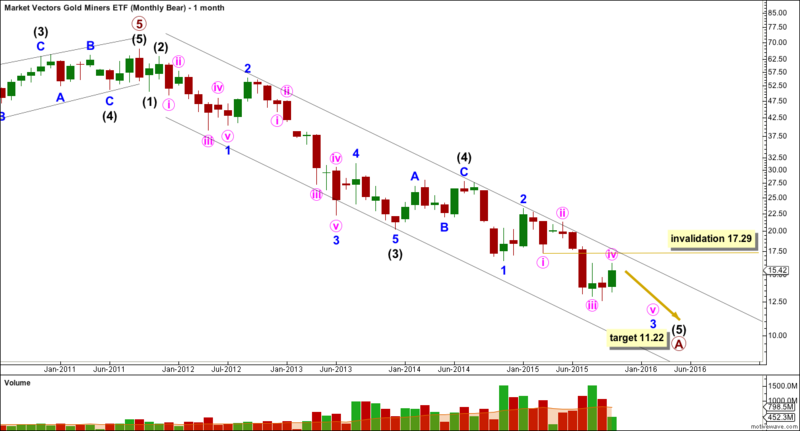 If minor wave 4 is a flat correction it would exhibit alternation with minor wave 2. This may include a new high above 23.22 for minute wave b, because within a flat the B wave may move beyond the start of its A wave. If this happens this alternate would be strongly favoured. At first glance it looks like minor wave 4 may be unfolding as a triangle, but that does not fit. Minute wave c would be slightly below the end of minute wave a which is invalid for a contracting triangle.